The right kind of office carpet can enhance acoustics, direct foot traffic, improve employee health and safety, and create a snug, comfortable and aesthetically pleasing work space. The question is, how does one select an office carpet when there are so many designs, materials and types to choose from? The first step is to consider the different functions of office carpeting. With those in mind, you’ll have a clearer idea of the type of floor covering that’s best suited to individual work spaces. Noise reduction: it improves the acoustic quality of an office by absorbing and muting sound. Optimised comfort: soft, springy fibres create a comfortable experience underfoot. Increased safety: it has a cushion-like effect on the spine, and knee, hip and ankle joints. It’s also more difficult to slip or trip on well-laid office carpeting. Antistatic: conductive fibres built-in to the material prevent static discharge and shocks. Aesthetic value: it offers greater design flexibility. Temperature control: fibres act as natural insulators that trap heat in winter and reduce room temperatures by up to 3 degrees Celsius in summer. Aside from the usual cost and colour considerations, there are a few other factors to deliberate on when choosing an office carpet. Questions around life expectancy, foot traffic, ease of installation, and what type of carpet is best suited to certain areas within an office, should all be addressed. Ideally, you want a durable type of floor covering that’s stain and soil resistant in high usage areas, such as corridors and communal areas. Carpet tiles that are cost effective, and easy to install and replace, are an excellent option. 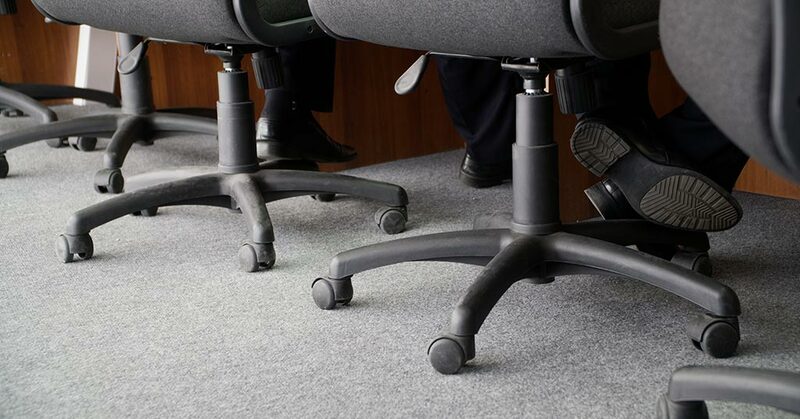 Thick carpets with a higher mass of fibres, preferably wool fibres, and an integrated cushion backing, are first choice for work environments where noise is an issue, while carpet types with a high resistance to moisture and wear and tear are the best bet in entryways and areas populated with castor chairs. The construction and type of carpet is of paramount importance when choosing an appropriate floor covering for your office. Should you go for wall to wall or carpet tile? How about tufted, woven or needle punched? Wall to wall or broadloom carpets are comfortable and luxurious. They are generally more expensive than carpet tiles and are ideal for high end projects that incorporate the use of large-scale patterning into the layout. 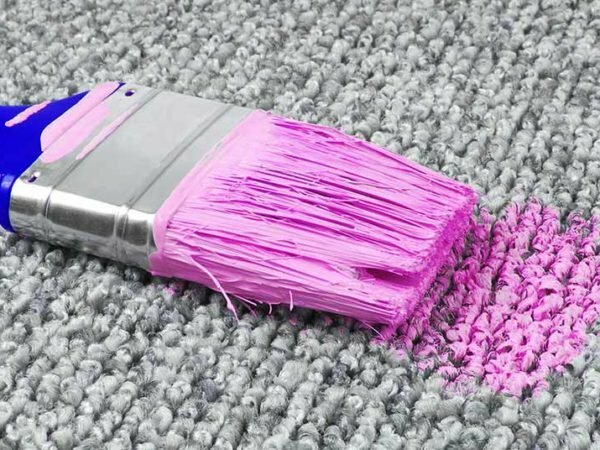 Broadloom carpets are more difficult and time consuming to install, and increased wastage can push the cost up. Carpet tiles are cheaper and more versatile. They are also easier to lay. Individual tiles can be lifted to enable access to underfloor cabling, or replaced when they get soiled or damaged. Carpet tiles are first choice in more casual areas with heavy to normal foot traffic. Tufted carpets are the most prevalent of all commercial carpets. They offer a quick and easy installation process and are appropriate for almost all office applications. Woven carpets are expensive, luxurious and manufactured from quality materials like pure wool or wool blends. They have one of the greatest Noise Reduction Coefficients, and are suitable for boardrooms and individual offices housing upper management staff. Needle punched carpets are tough, strong and utilitarian. They are not suitable for general use but are ideal in high moisture areas, such as office entry points and outdoor patios. The type of carpet backing and padding you choose can improve the overall feel and quality of the carpet. Backings provide added strength and stability, and prevent moisture from reaching the underfloor. Padding can enhance sound dampening and the soft step element required for the office environment. A general rule is, the more permeable the padding, the more effective it is in muting noise. The colour of a carpet is a highly personal issue, but experts agree that the darker, more muted colours – grey, brown and navy blue – are the most suitable for the office application. Darker colours are more intimate and hide spills and soils more effectively. Before you settle on a particular colour, we advise you to play around with a few samples. The carpet colour you’ve initially chosen may look completely wrong in a particular space or under the unforgiving office lighting. The longevity of an office carpet depends on how well it is maintained. High traffic areas, in particular, can become flat, soiled and dull. When that happens, the specialised services of professional carpet cleaners are required. A cleaning process that includes vacuuming, stain removal and deep pile carpet cleaning will extend the life of an office carpet, and leave the work environment clean, hygienic and fragrant. At Chelsea Cleaning, we don’t install carpets or rugs, but we do know how to clean them – expertly and at a reasonable price. Contact us for more information or a quotation and we’ll be happy to help.